High quality marine tools, accessories and convenience items for the serious boater and yacht enthusiast. View cart “Utility Scour Pads” has been added to your cart. SKU: 01- HM2. 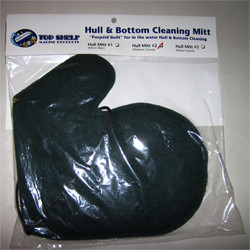 Category: Hull & Bottom Cleaning, Hull Cleaning Mitts. 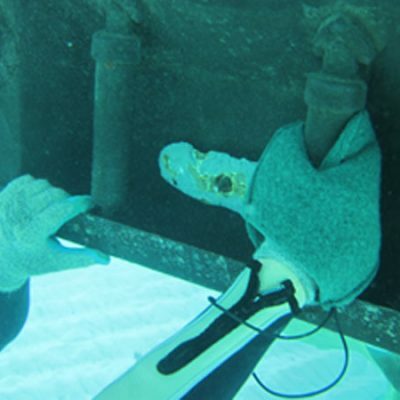 This Purpose Built mitt is designed to give you maximum coverage while cleaning the hull. The thumb cut out allows you to wrap it around the prop shaft and trim tab cylinders and pockets. This also allows you to carry a scraping tool in the same hand. 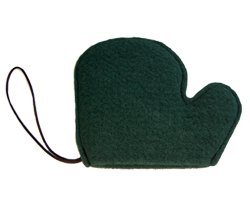 The mitt can be worn on either hand and used top or bottom. It’s made from medium coarse, rot free scour pad material and is great for ablative bottom paints that have been in service for approximately ½ their expected life. This material will remove some ablative paint along with the more stubborn slime. It comes with a 6″ wrist Lanyard. This is a consumable product and barnacles and other hard growth will limit its life. We suggest you scrape and chip all hard growth before the final rub down with the mitt. Always wear with gloves. This product is proudly made in the United States.